By Rezwan-ul-Alam, Director Outreach & Communication, Transparency International Bangladesh. 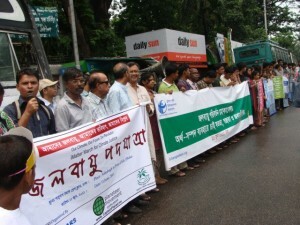 A month ago, Transparency International’s ‘Global Corruption Report Climate Change’ was released in Dhaka, Bangladesh. Since then, Transparency International Bangladesh has been working at both local and international level to keep up the pressure. It was fitting to launch the report from Bangladesh as the country is on the climate change front line, and at most risk to tropical cyclones and sixth most vulnerable to flooding. Climate change is a big issue in Bangladesh. Bangladeshi media extensively covered the event. The Daily Star carried an editorial highlighting the need for genuine concern over risks of corruption involving the climate financing. At a Meet the Media event Transparency International’s chair Huguette Labelle lauded the role of the Bangladeshi media saying they are a strong and important ally in the fight against corruption. The media continues to focus on several aspects of the climate change issues. Leading English-language paper the Daily Star carried a lead story on illegal forest clearance of the world’s largest mangrove forest, the Sundarban. As the Global Corruption Report warns, the mangrove forest is an essential ‘bio-shield’ against cyclones, high tidal surges, and coastal erosion, but is being weakened by illegal logging, which is in turn exacerbated by corruption. It was this problem and the suffering of people living in Bangladesh’s coastal regions, that lead so many to take to the streets to demand action. On 11 June, Transparency International Bangladesh joined hundreds of young people, environmental leaders and other local NGOs who braved the rain in a Climate Walk in Dhaka. The march was part of the international movement iMatter March for Climate Justice. The theme of the Dhaka march was Our Climate, Our Future, Our Revolution. The message is a lot like that of Dr. Labelle at our launch, when she reminded world leaders that climate change is the greatest challenge the planet faces today. It is important to get our messages heard on a world scale, especially by those who will design climate change policies. An opportunity to do so came in Bonn last week, when Iftekhar Zaman, Executive Director of Transparency International Bangladesh spoke about corruption risks in climate finance and the role of civil society and citizen participation in keeping it clean. He raised challenges like pollution, logging, climate projects being badly assigned (read about how TI Bangladesh rumbled corruption in climate spending here). Dr. Labelle had addressed this issue in another interview with Bangla daily Prothom Alo where she stressed the need for strictly adhering to compliance mechanisms to stop corruption in climate change projects. “Civil society should also participate in monitoring transparency and accountability; this will reduce the corruption opportunities,” she said. During her short stay, Dr. Huguette met TIB staff, Conveners of the Concerned Committee of Citizens, a voluntary country-wide anti-corruption networks supported by TIB, and important government officials, distinguished members of the civil society and media. The complete media coverage of Dr. Labelle’s visit to Bangladesh is available here. The seminar was also attended by a panel of guests of honors: Dr. Hasan Mahmud MP, State Minister, Ministry of Environment and Forest, Ghulam Rahman, Chair of the Anti-Corruption Commission and Saber Hossain Chowdhury MP, Chair of All-Party Parliamentary Committee on Climate Change. Three eminent panel discussants: Dr. Qazi Kholiquzzaman Ahmad, Chair of PKSF and National Coordinator of Climate Change Negotiating Committee of the Government, Dr. Atiq Rahman, Executive Director of Bangladesh Centre for Advanced Studies (BCAS) and Syeda Rizwana Hasan, Chief Executive of Bangladesh Environmental Lawyers’ Association (BELA) also spoke. Chaired by Advocate Sultana Kamal, Chairperson, Board of Trustees, TIB, the seminar was moderated by TIB’s Executive Director Dr. Iftekharuzzaman.